I will be launching my book on Social Enterprise on 20th October at 6pm. There will be a drinks reception at Hotel du Vin in Birmingham. It is free to attend. If you would like to join me please book via www.socialenterprisebook.eventbrite.co.uk. You can also book to attend the three course meal after the book launch but there is a charge for this. 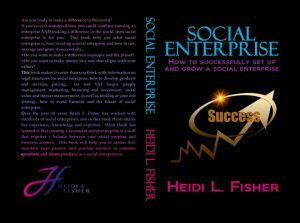 The book shares my experiences and knowledge around setting up and running social enterprises. After four years of thinking about writing this book, it is finally out of my head and on paper. There will be a few limited edition hardback copies available at the book launch, and after that it will just be available as an e-book. 50% of the proceeds from the book will be used to help children out of poverty around the world.